1 To create the wonderful tangy dressing, mix together Hellmann’s Real Mayonnaise and balsamic vinegar and set aside. 2 Combine the watercress, coriander, spring onion, cherry tomatoes and red chillies in a large bowl. Add the dressing and toss well. Place salad onto plates. 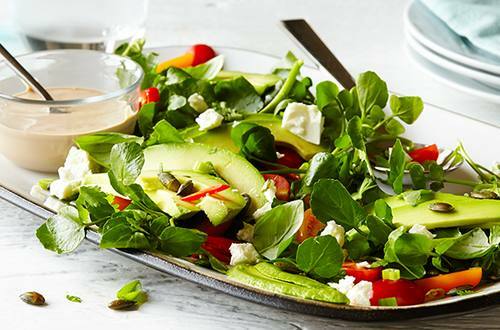 3 Top your plates equally with the sliced avocado, feta cheese, pumpkin seeds and basil leaves, then serve it up.